Simon & Schuster/Paula Wiseman Books, 9781416958147, 160pp. It is 1852 in Alexandria, Virginia. Eliza’s mother has been sent away and it is Abbey, the cook, who looks after Eliza, when Eliza isn’t taking care of the Mistress. Eliza has the quilt her mother left her and the memory of the stories she told to keep her close. When her Mistress’s health begins to fail and Eliza overhears the Master talk of Eliza being traded, Eliza takes to the night. She follows the path and the words of the farmhand Old Joe, “ … travel the night … sleep the day. Go East. Your back to the set of the sun until you come to the safe house where the candlelight lights the window.” All the while, Eliza recites the stories her mother taught her along her Freedom Road from Maryland to St. Catherine’s, Canada. NOLEN, Jerdine. 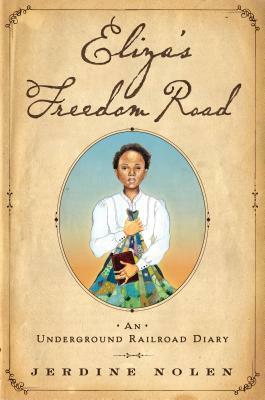 Eliza’s Freedom Road: An Underground Railroad Diary. 160p. map. bibliog. Web sites. S & S/Paula Wiseman Bks. 2011. Tr $14.99. ISBN 978-1-4169-5814-7; ebook $9.99. ISBN 978-1-4424-1723-6. LC number unavailable.